You probably wouldn’t believe me if I said I preferred savoury over sweet but it’s true. Don’t get me wrong I like the occasional sweet treat but savoury is my taste of choice. This weekend brunch recipe will definitely set you up for a days activities. Waffles are an institution in both Norway and Sweden, thinner than the Belgium variety and normally heart shaped and considered a real treat at Fika time or after a few hours walking or a cycle ride on a Sunday morning. 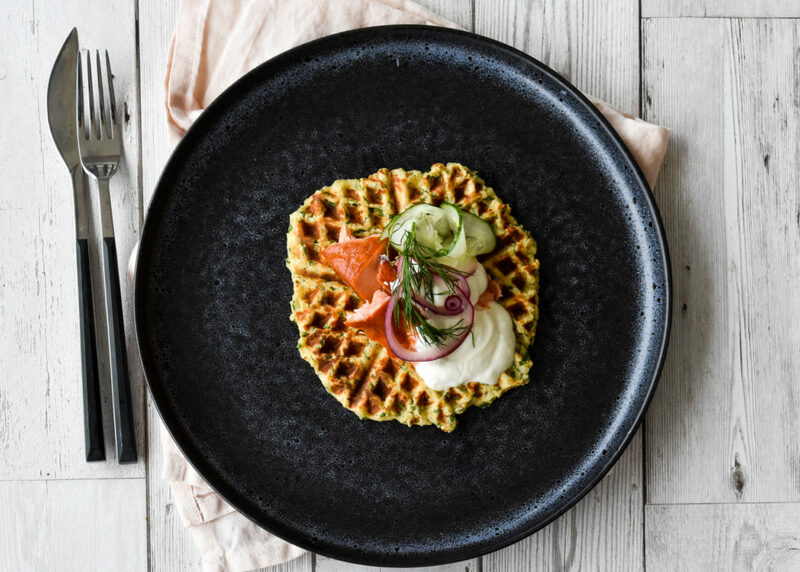 There’s even a day dedicated to eating even more of them, March 25th is a landmark in the Swedish and Norwegian calendar as it marks Våffeldagen (Waffle Day). There are numerous topping options but the most common is lingonberry jam with whipped cream. Traditional waffle ingredients include, milk, eggs, flour, baking powder and butter, basically pancake ingredients. These items are generally always in your store cupboard or fridge and therefore a fabulous standby meal. Topped with a mass of roasted vegetables and a generous spoonful of Greek yoghurt makes for a substantial healthy meal. 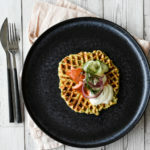 Potato waffles are also a good way of using up any leftover cooked potatoes. Mashed and then a little flour and egg added makes a perfect meal option. Grilled crispy streaky bacon and roasted cherry tomatoes with a few mushrooms is another great savoury topping idea for brunch. *If you are coeliac you can substitute the wheat flour with corn or potato flour. Begin by boiling the potatoes in their skins. When they're cooked through, drain and leave for 10-15 minutes to cool a little. Take the sliced onion and cucumber and place into a non reactive bowl. Add the vinegar, water, sugar and 1/4 teaspoon of sea salt. stir and leave for approximately 20 minutes before using. Peel the skins from the potatoes and mash, if you a potato rice this will do the job perfectly. When the mashed potato is cool add the eggs and flour along with the herbs and season. Have your waffle maker ready and proceed to make four waffles. Keep warm in the oven.